This has been a busy week for Congress, which means it’s been a busy week for activists. On Tuesday afternoon, Drew helped run a training session at the Friends of the Earth headquarters in Washington D.C. and prepared to take action at Andrew Wheeler’s confirmation hearing. At the training, six of us (including Drew) volunteered to risk arrest by speaking out during the hearing. The stories to be read were compiled from Friends of the Earth members and public reports on the impacts of EPA policy. 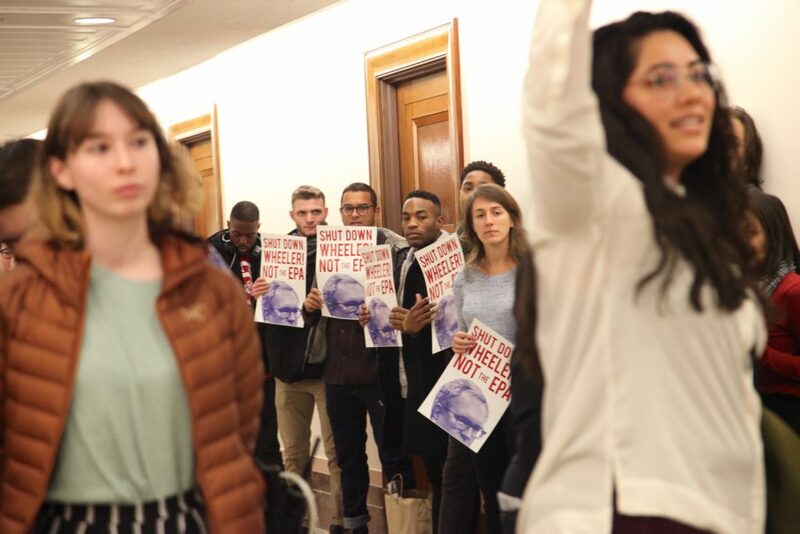 The goal was to highlight the injustice of Andrew Wheeler’s confirmation hearing while hundreds of people are impacted by the ongoing government shutdown. With so many people unable to pay their mortgages or afford critical medications, why is Congress prioritizing the confirmation of a puppet to the coal industry to lead the EPA? The next morning, we arrived on Capitol Hill to line up. We had to hide our posters in bags and under coats. 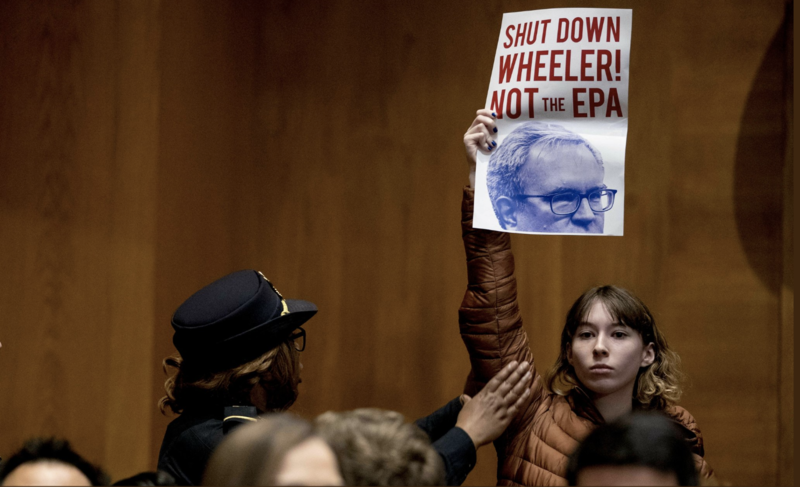 But Capitol Police and Republican Senate staffers suspected something – and in an attempt to prevent any kind of disruption, they filled the hearing room with EPA staff and Republican lawyers before the public was even let in. For this reason, Drew and I were the only pair to make it successfully into the hearing room before the doors were closed and those still in line were moved to the overflow space. We waited until Wheeler made his opening remarks and allowed him to introduce his family before standing up. 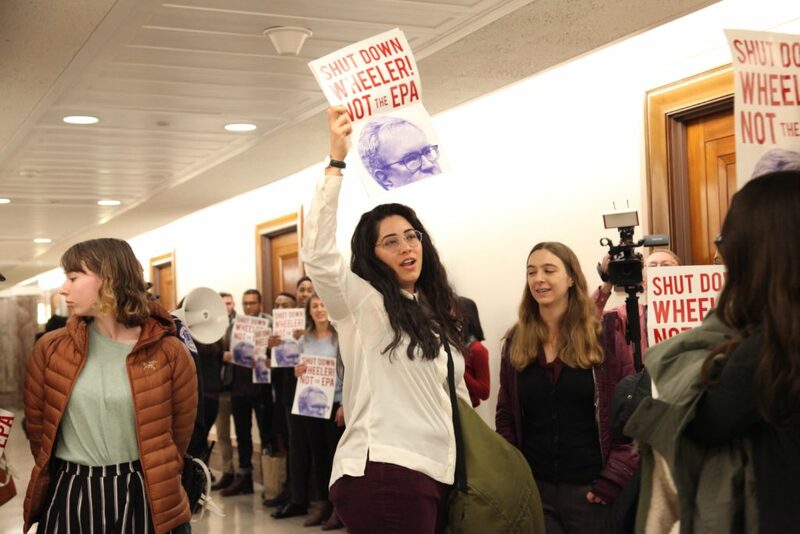 I held a sign and Drew shouted out the story a Texas woman who lives near a coal fired power plant that Wheeler wants to allow to pollute more. Capitol Police ushered us quickly out into the hallway where more than a dozen allier were also chanting and holding up posters. Four more friends were ultimately placed under arrest for refusing to stop chanting or disburse from outside the hearing. The rest of the crowd stood in the hallway outside of the hearing room with their posters in silence until all of us were escorted out. All six of us were released after paying a fine of fifty dollars. Later that same night, we were back at it, attending a meeting with 350 to plan and train folks for an action the following morning at the office of Senate minority leader Chuck Schumer. 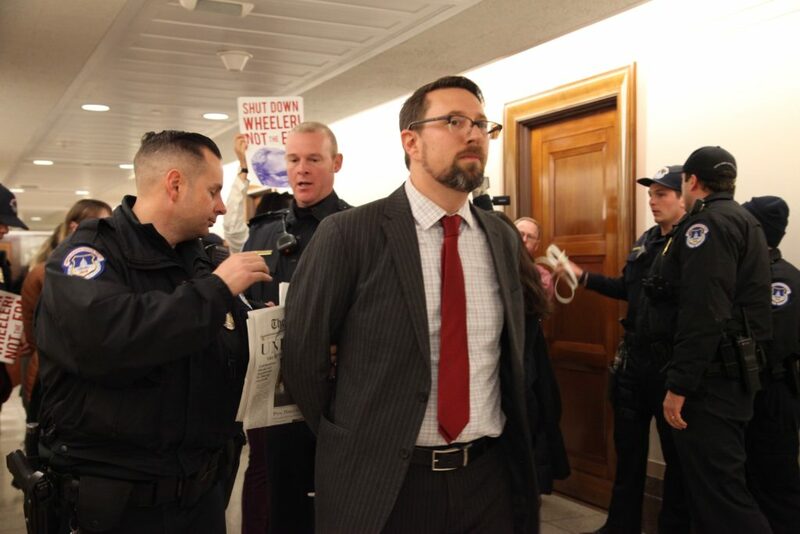 The plan was for a large group to enter the office of Senator Schumer and read out a letter demanding that he sign on to the Green New Deal. Members of the group would also tell their own stories about how the climate change movement has affected their lives. As we exited the office we would sing protest songs while two floors above, four people would drop a banner over the side of a balcony to be viewed from below. On the morning of the action, we met at Union Station and briefed a larger crowd that had not been able to attend the previous night’s training. Then we walked over to the Capitol to file through metal detectors and security checkpoints before making our way to Chuck Schumer’s office. The stories and testimony insider from impacted young people were powerful. And the songs and chants outside echoed through the hallways and marble lobby of the Hart office building. No arrests were made that day, since our banner team chose to comply with orders by Capitol Police to pull up the banner. On the lower floor, the larger group continued to sing, and share stories of climate impacts, until we were warned to cease and desist. After a second warning, the whole group together then walked over to the park across the street from the capitol building, where reflections and feelings of hope were shared before one final song was sung. Yesterday was Earth Day, and I’m sure you’re getting a million emails asking for money to “Save the Planet” and “stop the pipeline.” There are a lot of awesome groups out there doing great work, and I hope you support a few of them. This email is a little different. It’s longer, for one thing, but that’s not what matters. What makes 198 methods different (we hope) is our approach. We use digital tools to support direct action campaigns that can really shift the paradigm on climate – moments when by upping the ante just a little bit, we think we can turn the tables on the whole fossil fuel industry. First, in Albany: We’re supporting the Cuomo Walk the Talk action. Even if you’re not from new York, it’s worth paying attention to – because it’s the latest in a series of campaigns including the occupation of North Carolina Governor Roy Cooper’s office a few weeks ago, and the Brown’s Last chance campaign we’re supporting. All three (and lots of other great work) are aimed at getting Democrats who claim to be climate leaders to really step up. They also all have a common demand: 100% renewable energy, a ban on all fossil fuel infrastructure (especially fracked gas pipelines), and making polluters pay for wrecking our climate. By Democratic Governors in multiple states like this, there’s a real chance to raise the bar on what it means to be a “climate hawk”. And that’s absolutely essential in this moment. With climate chaos intensifying all around us – Climate disasters cost $307 billion in 2017, more than the entire Republican tax scam and more than $4000/US family of four – It’s no longer enough to “support” renewables or “believe in climate change.” Real leaders in 2018 need to be taking bold actions to stop taking carbon out of the ground, stop transporting it to locations it can be burned, and start a massive and wholistic overhaul of our energy economy. 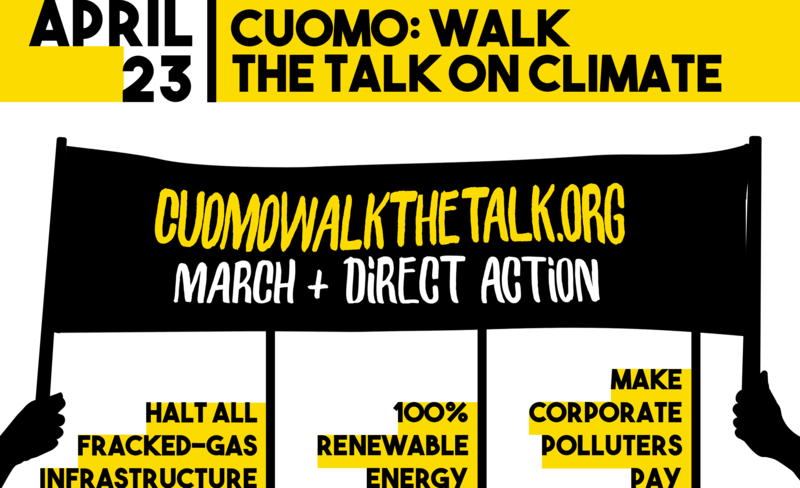 Tomorrow’s Cuomo Walk the Talk action could be the biggest milestone yet. It promises to be the biggest climate march in Albany’s history. And it lands at a really powerful moment when Cuomo is facing a primary challenge from Cynthia Nixon, who has a much more progressive platform on climate and clean energy, and has already rejected all donations from the fossil fuel industry. I’ve spent all day at the action camp planning a direct action component to this peaceful, powerful march and rally, and it’s going to be amazing. Check out the Facebook page for updates as well, Drew will post and share several live updates from the March, rally and the Direct Action. Chip in to support our work – after we cover the cost of the action (like our travel and food costs) we’ll donate all of it to the legal defense fund and local frontline groups in New York. That’s the most urgent news, but maybe not the biggest news this week. Pruitt to testify April 26. More than 200,000 of us have already signed on to a petition demanding Scott Pruitt be fired for his corrupt, disastrous leadership of the EPA. Now there’s a new report out from the Government Accountability Office that Pruitt’s $43,000 booth actually broke the law. It’s just the latest in a series of scandals that could finally sink his leadership of the EPA, and deny Trump a key surrogate that he was grooming to help him end Robert Mueller’s Russia investigation. We’re using Pruitt’s presence on the Hill to turn up the heat on Congressional Democrats, in particular – especially ones who claim to care about climate change and the EPA. For too long, these climate peacocks have sent letters expressing their “concern” or “demanding answers” from Pruitt about his outrageous spending, and even more-outrageous attacks on our environment and public health. But even as they’ve called him out and trumpeted their ‘resistance’ to Trump’s agenda, many of those same elected members of Congress have voted to confirm Trump’s cabinet — from Pruitt in 2017 to new climate-denying NASA administrator Jim Bridenstine last week. Not to mention the FERC commissioners who were confirmed on the same day as our action asking Democrats to lead on this issue last year. Instead of more letters expressing concern, climate leaders in Congress should demand Pruitt be fired right now – and move to impeach him if Trump won’t do it. It’s the same basic process as impeaching a President to Impeach a member of his cabinet – and now that the GAO confirms Pruitt has committed a crime, it’s great practice as well! That’s why later this week i’ll be in DC to support partners and allies taking action to Demand Congress do more than talk – that they actually take action by impeaching Pruitt. Sign and share the petition, if you haven’t already. And chip in to support all our work. You see the pattern: We need elected officials to do more than Talk: We need bold action to block Trumps nominees, ban new fossil fuel infrastructure, make polluters pay and move immediately towards a just transition to 100% Renewable energy. And this week, that’s what we’re all about. Shut. It. Down. Dream Act Now. There’s a principle in direct action called “shutting things down to open them up.” The basic idea is that since we know “power concedes nothing without a demand,” sometimes you have to shut something down in order to open up a conversation about the moral harm it creates. Click here to host or join a #NoDreamNoDeal rally near you this week. Click here or call 202-224-3121 and tell your Senators and Representative not to vote for ANY spending bill UNLESS it includes a clean Dream Act (the free click to call tool is sponsored by our allies at United We Dream). Congress has until Friday to pass a spending bill that will keep the government open — including the rogue deportation department called ICE — and we’re working in solidarity with a team that is demanding they say #NoDreamNoDeal and include a clean Dream Act. Anything less is a vote to fund the deportation of hundreds of our brothers and sisters who have lived here their whole lives. It’s about solidarity: In addition to being the right, moral thing to do, climate change and immigration ARE linked issues. As rising seas, extreme weather, and fights political and military create more and more refugees (including here in the US) we’re going to need smart, compassionate laws like the Dream Act. Just as important, these young undocumented Dreamers are essential to the fight to solve climate change — they’re showing up at protests, inventing better and cheaper solar panels, and doing the work we need young people to do. It’s a test for Congress: Climate change and the Dream Act have nearly identical political problems: huge majorities of voters support action, but Congress is slow to act. And too often, our so-called allies are quick to compromise and delay, when they need to stand and fight. We’ve seen this over and over again in the last 12 months as Congress, including Democrats who claim to be progressives, vote to confirm Trump’s nominees to the EPA, Department of Interior, FERC and other agencies. Just last month, the House Democrats stuck to their guns and refused to pass a spending bill without a Dream Act, but a handful of Senate Democrats buckled under pressure and gave Trump a victory (during which time he held a confused meeting about immigration, then made his infamous “Shithole” remark).We can’t let that happen again. We need to start sending the message to so-called progressive politicians that it’s not enough to talk tough about Trump and ask us to vote for you or your party. We need you to be willing to shut things down in order to make progress — just as we are. On September 5, Donald Trump repealed the Deferred Action for Childhood Arrivals (DACA) program. His decision strips children who were brought here illegally, called Dreamers, of their ability to live, learn, and work. Everyday Congress refuses to act 122 Dreamers lose their protection from deportation. So this week thousands of us will rise up and demand that our Representatives and Senators across the country make a choice and support Dreamers and a clean Dream Act. Please join us at a Wednesday or Thursday action near you – click here for details and to RSVP. If there’s not one near you, there’s still time to organize a quick rally or photo event with friends. The more visibility we have—even small events—the stronger our voice. We know that the public does not support the deportation of 800,000 immigrant youth who are doctors, lawyers, activists, and people who make our communities wonderful places to.